Back at E3 2016, We Happy Few was unveiled for the world to see as a game with hunger, thirst, health, and sleep meters that must be maintained as you play as a character named Arthur through an alternate post-war London where people take pills known as ‘Joy’. At that time, I described We Happy Few as “an amazing, albeit creepy title” “that I am looking forward to purchasing on day one”. 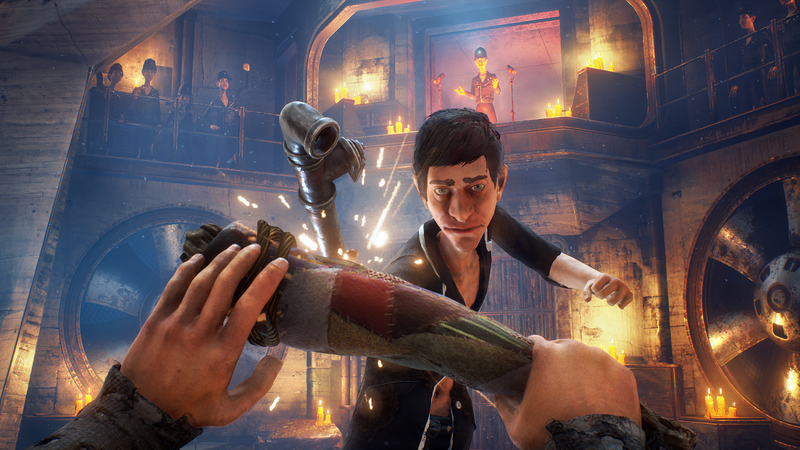 At E3 2018, I was able to revisit We Happy Few and see how the game has changed since I last played it on the Microsoft E3 showfloor. 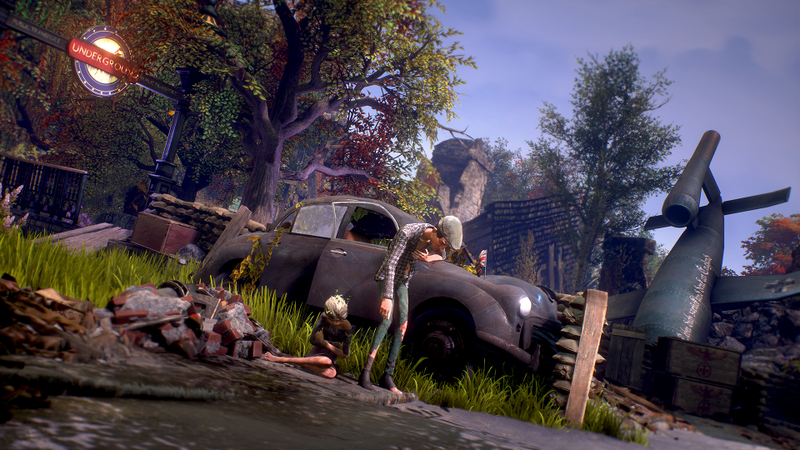 To my absolute delight, We Happy Few has changed a lot and in such a way to make the game accessible to a wider audience as it becomes more of an action/adventure exploration title instead of a hard-core survival simulator game. The survival meters in We Happy Few have been scaled back considerably since 2016, and your character will no longer die if he goes hungry/thirsty/sleep-deprived for too long (though it will impact your character’s stamina/stamina recovery performance). This single change had the biggest impact on gameplay. I was no longer trying to constantly forge for supplies to keep Arthur alive as long as possible, and so I instead focused on the desolate world around me and trying to accomplish the storyline in the procedural-generated (that is still there to great effect) dungeons between non-procedural set story points. Life for many of the people outside of the city is depressing and desolate. That being said, not everyone in We Happy Few will be happy to discover that Arthur has gone off of his Joy. (Image owned by Compulsion Games). The graphics are still stylized and gorgeous in We Happy Few, and I took my time visiting the various residences (and stealing from them in a system that reminds me of the search-and-loot function in the BioShock franchise). The British humor present in 2016 is still prevalent here, and the flashbacks that Arthur experiences to just after the War really build up the world’s underlying lore in a way that made me want to find out more. That said, however, combat remains fairly simple. You can attack, you can do a heavy attack, you can kick, and you can block…and that’s about it. You do have a stamina meter that you have to watch here, so you can’t just throw a flurry of attacks nonstop at your enemies, and you can equip weapons. There are also items that you can find (there are a lot of items to be found, actually) that you can throw to distract enemies as well, though I found that they only worked to minimal effect. During my demo of We Happy Few, Arthur found himself in an underground cage match against someone that he used to know. 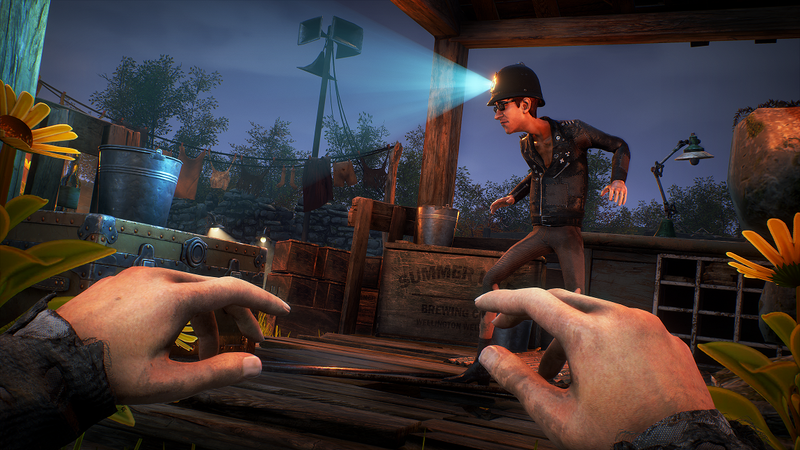 Weapons -and crafting said weapons- are an integral part of We Happy Few. (Image owned by Compulsion Games). The last thing to talk about is the crafting system in We Happy Few. Everywhere you go, there are items for Arthur to pick up and combine into something new. Crafting was an integral part in We Happy Few‘s 2016 E3 demo, and that hasn’t changed here in 2018. You can craft weapons, you can craft health items, and you can even craft story-related items (I had to combine a stone with my character’s suit in order to shred it, for example, as a plot point). This crafting system is vital to being able to play through We Happy Few, and it is thankfully an accessible system to utilize during the game by combining items in the crafting menu. There are stealth mechanics as well, and you can throw items to distract enemies as you sneak past them. (Image owned by Compulsion Games). Overall, I thought this game was amazing, and it has only gotten better as it has left Early Access. Despite Microsoft’s announcement at E3 2018 that they have acquired Compulsion Games, this game will be coming to Xbox One, PlayStation 4, and PC on August 10, 2018. You can preorder We Happy Few now for Xbox One (Regular and Deluxe Editions) and PlayStation 4 (Regular and Deluxe Editions). Are you excited about how We Happy Few has evolved since E3 2016?